296 pages | 12 B/W Illus. China and the ASEAN region have risen rapidly to a position of immense economic significance in the global economy. 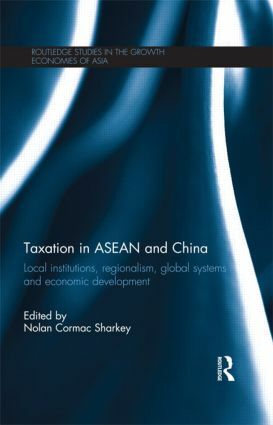 Academics, policy makers and businesses are all keen to understand more about taxation in China and ASEAN, and this work seeks to address this key issue by providing a comprehensive overview of the many often mentioned but little understood challenges of doing business in the region. Traversing a wide range of regional issues and jurisdictions, topics covered include the role of DTAs in regional integration, the impact of social institutions on tax, corruption and its causes, economic development and taxation and the use of education in developing systems. Case studies are taken from countries such as China, Vietnam, Hong Kong, Singapore, the Philippines, Malaysia and Indonesia. Drawing on the results of these discussions, the book also sheds light on the question of whether different taxing institutions are needed in the region. Gathering together a cross-disciplinary group of eminent scholars, this work will be of great interest to all students and scholars of Asian economics, Asian finance and taxation in general. Nolan Cormac Sharkey is Senior Lecturer at the Australian School of Taxation, University of New South Wales, Australia.